Chluy bowl at Phnom Penh Noodle Shack. Photo by Sarah Bennett. Technically Cambodia Town extends only a block in either direction from Anaheim Street, but the legendary Phnom Penh Noodle Shack is close enough to count. 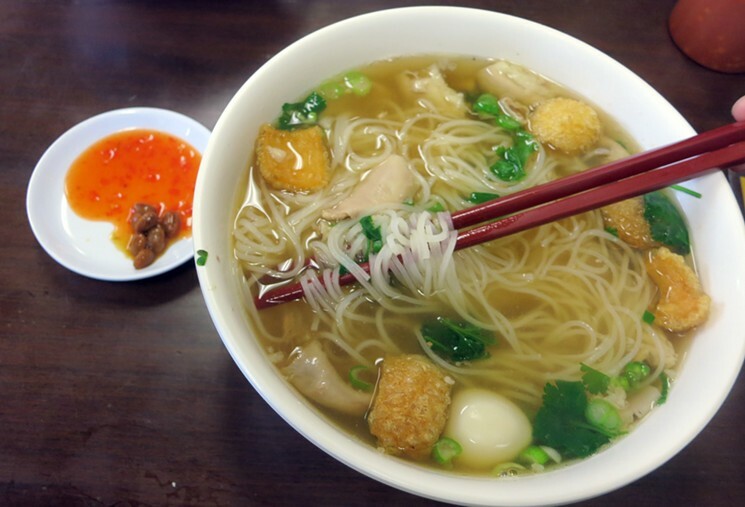 Three blocks up Cherry and built into a former house, “the Shack” (as it’s informally known) is now run by second-generation owners and is the only place in the L.A. area specializing in kuy teav, or Cambodian noodle soup. As the Cambodian version of pho, kuy teav is mainly a breakfast dish where you get to pick your type of noodle (rice, egg or teardrop) and meat (veal, ground pork, beef balls, seafood and lots and lots of offal), and it comes either wet as a soup or dry with a bowl of porky bone broth on the side. Try the Chluy Bowl — quail eggs, tripe and pork rinds — and don’t forget an order of fry bread to soak up all the juice.